Made with real fruit. With added multi-vitamins. No added sugar - contains naturally occurring sugars. No artificial colours or flavourings. When kids are busy doing the things they love, we're right there with them. Keeping them refreshed with our great tasting drinks. It's just what we do. Our hand picked oranges are grown in warm, sunny climates. Ripened and harvested when they're lovely and juicy, before being pressed and squeezed. 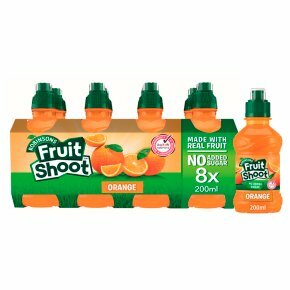 That's why every bottle of Fruit Shoot is so delicious fruity. WARNING: CHOKING RISK. Cap contains small parts.<br>Unsuitable for children 36 months.<br>Open by hand. Don't refill bottle.